The stakes are high, and with demand on the rise for durable, lightweight and sustainable materials, the Aluminum industry’s contribution to the U.S. economy — and with that, to the renaissance of U.S. manufacturing — is significant. While the U.S. is home to significant bauxite deposits, from which aluminum is sourced, we import a significant percentage of the aluminum consumed domestically. Unlike with other metals and minerals, this represents a marked decrease in geopolitical risk, as most of our aluminum imports are sourced from one of our closest trading partners, Canada. In fact, in 2015, Canadian-sourced imports accounted for 65% of crude aluminum, 21% of semimanufactures, 64% of scrap, and 54% of total aluminum imports. In other words, viewed in isolation and from the upstream end of the supply chain at the minesite, the U.S. is increasingly import-dependent for the aluminum it needs. 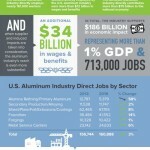 But in the context of an integrated North American supply chain between the two trading partners, a look at USGS’s 2014 Minerals Yearbook reveals that Canada is helping the U.S. close a 3.4 million ton domestic aluminum production shortfall by supplying more than 2.2 million tons of crude ingot and 227,000 tons of semifabricated aluminum. The geopolitics of resource supply are complex and constantly changing. Trade gives us a more complete picture — but the fundamental fact remains that in our tech-dependent era, manufacturing might is rooted in reliable resource supply.